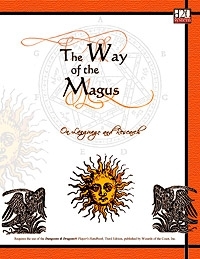 Wild Hunt Studio’s Way of the Magus series is intended to expand the options available to both wizard characters in the d20 system and to those playing them. There are currently two books in the series available for purchase via RPGNow. On Language and Research concentrates on helping both GM and player bring the archetypal wizard character to brilliant life. Purchase this product from RPGNow. 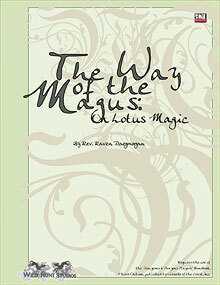 On Lotus Magic describes the forbidden use of the lotus drug, distilled from the essence of the lotus flower, to enhance the power of any spellcaster…for a price. This book contains descriptions of five different loti and their effects, including the deadly black lotus, plus outlines rules for the dangers of addiction, injury and possible death that accompany their use. Will your character tempt fate to gain greater power, or are they enemy to those who sell and use these exotic and dangerous blooms? This product is 15 pages, including cover; full color and bookmarked. All proceeds made from sales of this PDF are being donated to a Kiva loan fund: helping poor individuals create and expand entrepreneurial businesses to help lift them, their families, and communities out of poverty. Want to help fund our Kiva loan?